the virtuous journey: It's Next Level, Baby! Let me introduce NEXT LEVEL MOVEMENT a.k.a. NLM. This is a music ministry that God created years ago (I don't want to misquote the number of years, but it's been many, many). The vision was given to Pastor Dre a.k.a. Da Voice and is being fulfilled by him & the rest of the crew (introductions to come...). 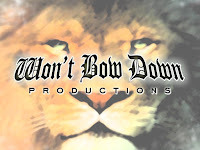 We make music under the Won't Bow Down label. Our music is created to bring glory to Jesus Christ, spread his gospel, edify the body and awaken unbelievers. As DJ Wade-O says, "It's more than music, it's ministry!" A more official NLM post will come soon with links to our site(s). I just wanted to say how decent it was to be in our CT studion while sitting at my desk in PA. We did this using Skype and it was very productive. I needed Bri, a hot vocalist in our squad, to put some finishing touches on my project. I was able to work with her and producer extraordinaire, Pastor Dre, to accomplish all tasks successfully! My project is titled "Here I Am" and is scheduled to release late February. I am excited as this has been years and years of work - not by choice, but that's how it worked out. God is good, He gets all the glory and His timing is impeccable. Stay tuned. More NLM info to come...It's Next Level, Baby!